*Auto-increment licenses must be able to phone-home to report instances used, this will automatically increment your monthly billing and will adjust this up and down according to instances used above any minimum: CLD has a minimum of 3 and can be incremented. All perpetual licenses have a minimum of three instances and higher levels can be purchased by upgrade. For hosting levels see the Hosting Membership schedule section of this site. See how this 'License with Instances' works in real life. 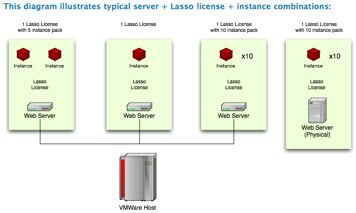 See the set-up explained, and find out more about how to determine if you need more Licenses, or just most Instances on your License. And don't worry - it's easy to increase your levels to suit if you want to start conservatively.